Smokey Guerrero asks, "How do people who cheat to achieve their goals feel any personal satisfaction or pride?" (Letters, Dec. 15). Fortunately, most of us feel the way he does, but there are some who feel that cheating is a legitimate way to help them succeed. I was awakened to that about 20 years ago when the University of Hawaii's Ka Leo reported that when the winner of the student body presidential election was questioned about having broken several election rules, he stated in a matter-of-fact way that he did that because if he hadn't, he would not have been able to win. 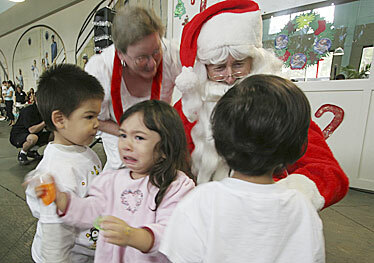 This little girl didn't seem happy to see Santa Claus at Matson's annual Christmas party for kids with disabilities. More than 100 Easter Seals children and families gathered Dec. 14 at Aloha Tower for the party. This is the Christmas season -- a time for giving and receiving gifts. What's Christmas all about anyway? Wasn't there a death, an emptiness need? Wasn't there a love somewhere -- infinite, eternal, unchangeable -- a love that gave his only son anyway? That's what Christmas is all about: God coming to Earth in the person of the Christ child to do for you and for me what we cannot do for our ourselves. Jesus lived among us and had the same kinds of problems that we do. You haven't a problem that he doesn't understand. He spent his life meeting human needs. He died on the cross to deal once and for all with our greatest need -- the sin problem. Just before ascending to heaven, the risen Christ gave this glorious promise: "I am with you always" (Matthew 28:20). That's what Christmas is all about. This Christmas, God is asking you to come to him. You with your failures, your sins, your problems, your fears. You. This is Christmas. Redemption's glorious exchange of gifts! It's not about Happy Holidays, but Merry Christmas. To the women and men who run America's retail stores: You win, and thank you. My friends and I finally see the wisdom of replacing Christmas with a holiday season, and it's wonderful. Just think of the money we save by replacing Christmas' gift-giving tradition with the fun of obligation-free holidaying! The time and money set free by abandoning Christmas now lets us give our families, friends and loved ones the best of all gifts -- time spent having fun with them. Goodbye to soon-to-be-broken or returned gifts. Hello to memories of laughter at spas and similar getaways. Thanks. I admire the selflessness it took to replace Christmas and its gift-giving tradition with holidaying that makes no such demand. Especially since your predecessors spent so much time and money to generate guilt-induced gift buying. Not to mention the brilliant use of Santa to secularize it so it snared all children. But you did the right thing. I am sure the rewards you find in heaven will repay you for lost earthly revenue. I guess Christmas came early for Hawaii this year. The golf course workers who allegedly stole, slaughtered and ate Mr. and Mrs. Manuma's 8-month-old pet dog should be prosecuted under the fullest extent of the new law making it a felony to treat animals in such a manner. When the law passed last session, lawmakers intended to crack down on inhumane puppy mills, maltreatment of animals in denying them food and water, and other cruel practices. As the author of the law, I never could have imagined that a tethered puppy would be viewed as a potential meal. I call upon the prosecutor to use this new law to send a clear and strong message to all who consider animals less deserving of the basic minimum conditions for life and health that we humans enjoy on this earth. Tom Berg's Dec. 9 commentary on the Honolulu rapid transit project contains numerous misstatements. One is his assertion that PB Americas "chose" rail for Honolulu but "chose" managed lanes or toll lanes for other cities. PB Americas is a consulting firm involved in the planning, design and construction of mass transit projects around the world. Our role is to develop information -- cost estimates, ridership forecasts, environmental impact assessments and the like -- on various ways to address transportation problems and needs. The analysis process is open and participatory. We ultimately present our findings to local officials, who choose the alternative that best meets local goals. In Honolulu, the choice of a fixed guideway transit system was made by the mayor and the City Council. Our experience has proven time and again that each city is different -- the best alternative in one city or corridor might be totally inappropriate in another. Although the Charter School Review Panel appreciates the Star-Bulletin's Dec. 15 article on Reshela DuPuis, the new charter school executive director, the panel takes exception to misinformation regarding the former charter school leader Maunalei Love. Love served Hawaii's charter school community with distinction during the 14 months of her tenure as interim executive director of the Charter School Administrative Office. She was an outstanding advocate for Hawaii's charter schools and charter school system, and she provided excellent service to the Panel. The statement in the article that Love "barely held onto the interim job for a year" couldn't be further from the truth. In fact, the panel was pleased that Love's name was one of two originally proposed by the Hawaii Charter School Network to fill the permanent ED position. Love decided to withdraw as a candidate, however. Under Love's leadership, Hawaii's charter schools have grown and flourished, and the panel wishes her great success in her new endeavors. Mahalo nui loa, Maunalei. It is sickening to hear all the tributes and accolades the news media have been giving to Lisa Matsumoto, given that she was the one driving the wrong way on the freeway and on top of that reportedly had a blood alcohol level three times above the legal limit. Yes, she might have been a loss to Hawaii for her contributions to Ala Moana's Christmas play and some children's stories, but she also almost took the life of Cassie Olaivar, a young woman who also could have made a contribution to Hawaii and the world (and hopefully still will). I feel more sorry for Cassie because she will never be the same with all those life-threatening injuries and will suffer with pain for the rest of her life and for what, driving responsibly in the right direction and not drunk. The media need to honor those people who live and die the right way and not pay tribute to people whose actions in life and in death cause the suffering, injury or death to others. It is indeed tragic to read of the circumstances via which local playwright Lisa Matsumoto came to meet her maker, by going the wrong way on a major freeway at 3.30 a.m. ("Matsumoto was drunk during fatal car accident," Star-Bulletin, Dec. 18). Certainly I can understand the outpouring of grief by her many friends and close relatives, not to mention their concern for the victim going the right way. However, I have cause to inquire, where was Matsumoto consuming alcohol in copious amounts, and who with? Surely someone could have recognized an obvious problem, or even a bartender at the time, to prevent this tragedy at such a young age. The police are still investigating how she ended up driving against traffic ... really? Are there not video cameras that record traffic movement for us all to see? With her deceitful act, Rep. Karen Awana is quoted as saying the reason she switched to the Democratic Party was "to be more effective at addressing the needs and concerns of the community." Her community, supporters, advisers and donors elected a Republican and she shames herself by switching in midterm. The Democrats could not have promised much because they have done little for any community in Hawaii for more than 40 years. Virtually all our communities need better public schools, more affordable housing and relief from the second-most-regressive tax in the nation. These are the problems that our Republican governor and lieutenant governor and Republican House and Senate caucuses are working to fix. Awana will find what most of us already know. The Democratic Party has been making promises to the people of Hawaii for more than 40 years and has not done much to keep any of them.